Bryden Giving ’16 reflects on the path to healing—for himself and others. 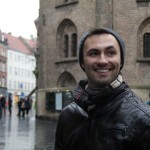 Bryden Giving is passionate about healthcare and travel, but mostly he cares about people. The Big Lake, Minn. native was able to combine his passions at the Danish Institute for Study Abroad, where he won the Academic Excellence Award for Child Development and Diversity this summer.